UPDATE: We had 9 participants for this session, keep an eye on this website and the HackJam FB group for the next edition. 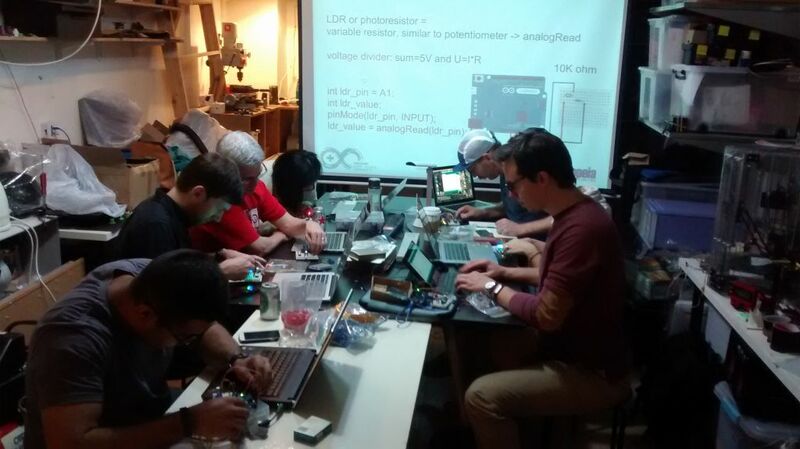 Due to popular demand another edition of the Arduino hands-on introduction workshop at DSL on Wednesday 6 May 19:00-21:00! Weâ€™ll introduce you to the basic Arduino setup and terminology of the worldâ€™s favourite open-source electronics prototyping platform, using your laptop to write short programs to control your Arduino. Weâ€™ll experiment with some simple hardware components such as LEDs, photoresistors, buzzers etc on a breadboard. These components are included in the workshop fee.Â No specific experience with hardware or software required. You will need to bring your own laptop, and install the Arduino software (IDE) in advance. You can have a look at the slidesÂ here. If you don’t have an Arduino board yet (any type) then i can order one for you from RS Components if you let me know 1 week in advance (HKD 220 incl USB cable). ← Saturdays declared Bao Enrichment Days – B.E.D.